The Ames Building is a 13-story structure located at 1 Court Street in Boston. 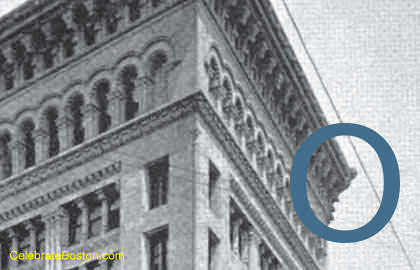 It was built in 1889 and is considered by many to be Boston's first skyscraper. The architects were Shepley, Rutan, and Coolidge. This famous building recently underwent an $18 million renovation and re-opened as the luxurious Ames Hotel. The style of the building is Romanesque, with Second Renaissance Revival elements. The construction is masonry, with a large granite base and a brick wall system. 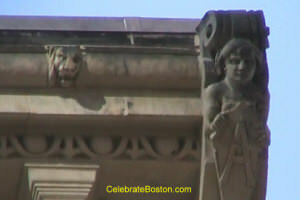 There are tiers of ornate arched windows, mosaic etchings, reliefs in sandstone, and a heavy cornice. A strange and obscure story about the Ames Building is described here. At the very top of the building, in the northeast corner near City Hall, is a bas relief of a woman holding the monogram "A" for "Ames." This corner of the building used to overlook Adams Square, a bustling cross-road that connected Washington Street with Dock Square (at Faneuil Hall). Adams Square was completely demolished in the early 1960s to make way for Government Center and new Boston City Hall. Messrs Swashle, Shwashle, & Squimp, consulting architects responsible for the building [this editor cannot collaborate the existence of this company], insist that the plans did not include the head of Mr Hohenzollern [Kaiser's family name]. The change will be made immediately. Tomorrow morning at 6, Mayor Peters, who, although it is not generally known, has had considerable experience as a human fly, will scale the side of the Ames Building, and push his fist into the Kaiser's face. Then he will tie a stick of dynamite to the figure's nose, set flame to a fuse, and jump lightly to the street. This, it is believed, will be one of the last acts of the Peters Administration." This editor cannot collaborate the existence of an original Kaiser-like relief, but has seen old photos of the northeast corner of the building. The image below is from 1892, and one can see a protruding figurehead that seems to be wearing a helmet similar to those worn by German officers in World War I. If one looks closely at the photo above of the cornice, there is also evidence that the very top corner of the building was hacked off at some point, with its capital having a different color than the female bas relief below it. It is doubtful that Mayor Peters scaled the building back in 1920, but it appears at some point someone chopped off the original figurehead that overlooked Adams Square. What is fascinating is that Kaiser Wilhelm II ascended to power in Germany on June 15, 1888, which during the same time period of when the Ames Building was under construction. Whether the bust on the building was intended to honor the Kaiser, or accidentally resembled him, will probably never be known.